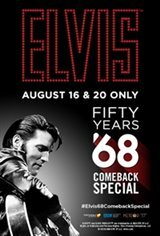 See the iconic television special starring singer Elvis Presley, that originally aired on December 3, 1968. It marked Elvis Presley's return to live performance and re-launched his singing career. This anniversary event includes the legendary television special, plus an exclusive look at the making of the special, featuring a walkthrough of the NBC soundstage with insights from producer Steve Binder and others influenced by Presley, his music and this iconic event. "It was so cool to see Elvis on the big screen! He looked and sounded great!! I had seen The King in person 2 times...1975 & 1976 at The New Haven Coliseum!!"